Happiness Project Recipe #16.5: Peanut Butter Chocolate Chip Granola Bars! Have you ever walked through a grocery store & come face to face with a certain food item that put your knickers in a twist? A few nights ago, after unsuccessfully attempting to fend off a ruthless craving for granola bars, I was faced with a rather odd food dilemma. I could have very easily just cheated by buying a package of pre-made granola bars but nooooooo, the invisible pastry chef sitting so snugly next to my ear (much like the devil on one shoulder & the angel on the other) refused to let me succumb to such unusual laziness. “Why buy when you can make your own?” she asked. So with a tiny bit of grumbling, I did. 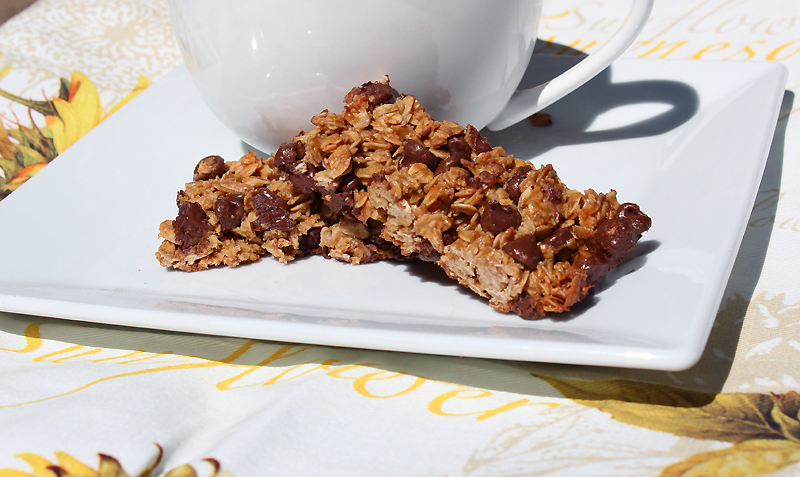 Hence this now perfect opportunity to share my favorite granola bar recipe with you! In a large bowl (either in a stand mixer or by a hand held mixer), beat the peanut butter, honey, egg, oil and vanilla until blended. In another mixing bowl, combine the oats, brown sugar & salt and mix together with a spoon (or by hand, if you want to add a little extra fun to your day). Now pour the dry mixture into the wet (peanut butter) mixture and mix well. Make sure your entire batch is nicely, evenly coated. Gently stir in your peanut butter chips & chocolate chips. Your batter will now be very, very sticky (and will smell quite divine!). Transfer to a 9×13 inch baking dish coated with cooking spray. Since the batter is quite sticky, with your fingers, gently & tightly press the mixture into the edges of the pan until evenly spread throughout. Bake at 350F for 20 minutes until the edges are lightly browned. Remove from the oven & let cool on a wire rack for about 30 to 45 minutes to let the granola harden properly. Once the granola is cooled & set, take a serrated knife & gently cut up into however many bars you would would like (I like to cut up longer bars so I usually end up with around 12). I also tend to like a crisper granola bar versus a chewier one, so after initially cutting up each bar, I drop my oven temperature down to 300F, spread out my 12 bars onto a second sprayed cookie sheet & pop them back into the oven for another 5 minutes. So whether you want to go crispier or chewier, it’s all a matter of preference. You’ll be happy with the end result, either way. Fun, right? Now every time you too come across your own grocery store dilemma, you won’t be haunted in the least by that ruthlessly nagging little pastry chef on your shoulder. Granola bars from scratch? Why yes! Yes, indeed! « Happiness Project Recipe #16: Honey-Oatmeal Chocolate Chip Cookies!